This is a video of street singers from around the world being recorded, overlaid and mixed with one another while singing “Stand By Me”. Truly inspirational and shines a bright light onto the key question of our times: what do we truly value? So turn up the speaker volume and go to widescreen! 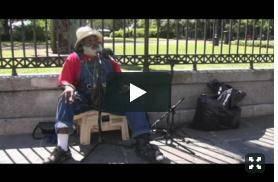 Stand By Me | Playing For Change | Song Around The World from Concord Music Group on Vimeo. Playing for Change is a multimedia movement created to inspire, connect, and bring peace to the world through music. The idea for this project arose from a common belief that music has the power to break down boundaries and overcome distances between people. No matter whether people come from different geographic, political, economic, spiritual or ideological backgrounds, music has the universal power to transcend and unite us as one human race. And with this truth firmly fixed in our minds, we set out to share it with the world.